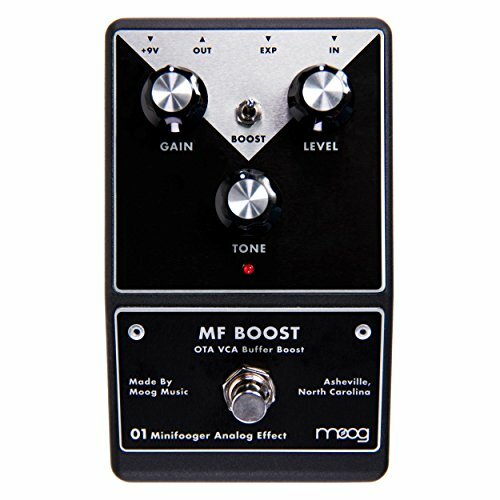 If you've ever needed that indefinable extra bump to rev up your tone, then the Moog MF Boost Minifooger series analog boost pedal may just be the thing that's missing from your pedalboard. There are two kinds of worthwhile boost pedals out there - clean boosts and dirty boosts - and the MF Boost is both of them. In its clean setting, the MF Boost offers up the sweet shining sound of ultra-clear VCA circuitry. We're talking about epic headroom to spare here. Conversely, the OTA dirty path takes the MF Boosts natural compression and adds a healthy dose of boutique coloration to spice things up. Added bonus: if you hook up a CV expression pedal, you can use the Moog MF Boost as a volume pedal and access gain levels beyond panel control.